HOUSTON (AP) Nobody needs a day off in this World Series more than those run-down relievers. Houston never even used struggling closer Ken Giles in its 13-12 win in Game 5, which ended early Monday morning after each team employed seven pitchers in 10 innings over nearly 5+ hours. 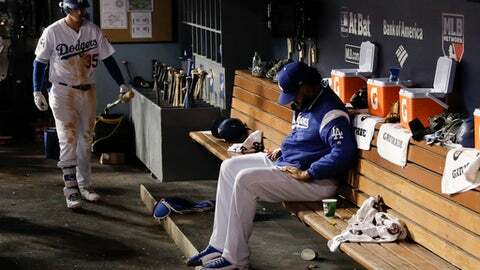 The loser was Kenley Jansen, the Dodgers’ All-Star closer who had already blown a save in Game 2 – matching his total during the entire year to date. For the first time ever in 2016, not a single starter recorded an out after the sixth inning of any game – and that Series went the full seven games. Dodgers starter Alex Wood didn’t allow a hit until giving up a homer with two outs in the sixth – and that was the last batter he faced. Houston’s Charlie Morton allowed three hits and hit a batter while pitching into the seventh.